Today, the world's best tennis players in the business will be in a duel to clinch 2012 first major title here at Melbourne. 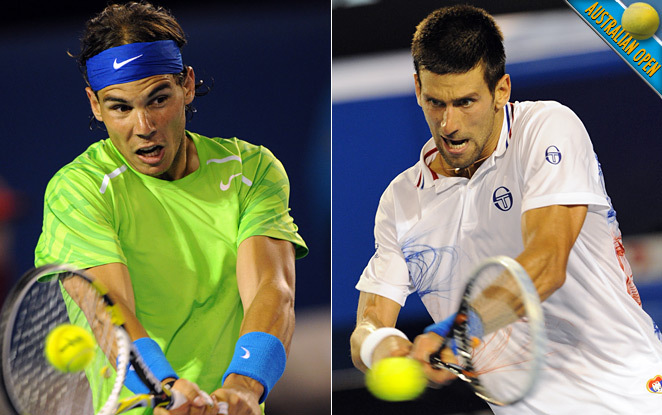 Both Spanish Nadal and Serbian Djokovic have had a sublime tournament so far. The Semi Final was also one of the finest in recent time, where top four players produced some scintillating tennis. Nadal over ran Federer in four sets, whereas Djokovic had to struggle hard to overcome an angry and determined Murray finally set his date with Nadal and gruelling five setter. Talking head to head between World number 1 and 2, Nadal has not have a good number of outings if 2011 is taken in perspective, where he lost all 6 encounters, but Nadal still leads overall by 16-13. But still this is a new year, new determination, new circumstances which will provide the fans with heck of a tennis. Talking off odds and evens, for this finals the stakes to be 55-45, with five additional to Nadal, reason being might be Djokovic's painstaking four hour 50 minute battle might have taken some toll on him. Lastly on anyone's winning today the position table will remain unchanged. The match will commence at 0830 GMT, live from Rod Laver Arena, Melbourne, Australia.